All properties on the marketplace have now been revalued. Read the latest analysis on performance this quarter from our Director of Property, Robert Weaver. Each quarter, independent RICS certified surveyors revalue all properties on our platform. Today, as we do on the 5th of the month following all quarter ends, we have updated the “Latest Valuation” and “Latest Share Valuation” on all properties to reflect the latest valuations up to 31 March 2017. Residential property continues to perform strongly as an asset class and this is also true of the properties on our platform. The “total return” of residential investment property comprises net rental income and capital growth from value appreciation. 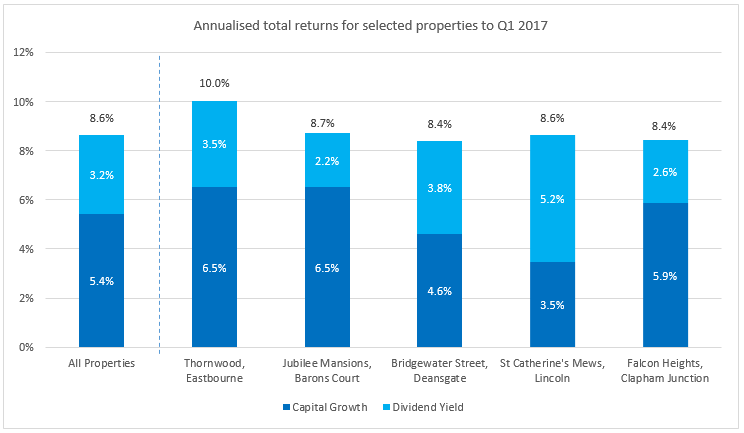 Up to the quarter ending 31 March 2017, the properties on our platform delivered an annualised total return of 8.6%, comprising 3.2% of net rental income after all forecast costs (Dividend Yield) and 5.4% of capital growth (reflected in Latest Valuation). Further details behind this calculation, including the performance of each individual property, can be found here. *Property Partner does not provide investment or tax advice and any general information is provided to help you make your own informed decisions. Capital at risk. The value of your investment can go down as well as up. Forecasts are not a reliable indicator of future performance. Gross rent and dividends may be lower than estimated. 5 yearly exit protection or exit on platform subject to price & demand. London House Exchange Limited (8820870) is authorised and regulated by the Financial Conduct Authority (No. 613499). See Key Risks for further information.